Life is hard enough in Haiti, with its profound poverty, natural disasters, and troubled political history. Add to the mix an insidious tropical disease that causes permanent disfigurement, and the result is misery that defies description. Antoinette Sainfabe, about 40, lives in a destitute section of Léogâne, the epicenter of the catastrophic earthquake that struck Haiti in 2010. She was buried under the rubble of her home for three days; a diagonal scar across her forehead serves as a reminder of the trauma. Sainfabe and her children lived beneath a banana tree for three years until a relief organization built her a new home beside the ruins of the crumbled one. Her children love her signature beans-and-rice dish, but her part-time cleaning job doesn’t pay enough for her to buy fresh food every day. Sainfabe contracted lymphatic filariasis (LF) from the bites of infected mosquitoes. In 1993, the disease caused her legs to swell irreversibly to almost twice their normal size, which makes it hard to walk, hard to get and hold a job, and hard to avoid being stigmatized. It’s practically impossible to find shoes that fit, so she, like the other women in the Hope Club, her lymphatic filariasis support group, improvises with strips of Velcro to extend her sandal straps. 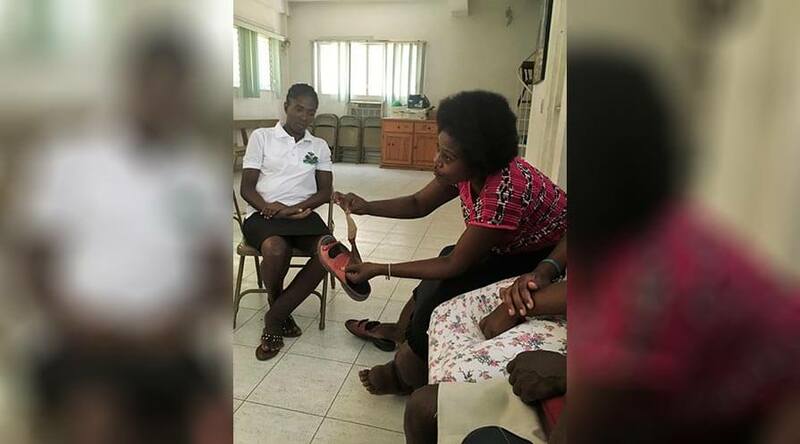 During a lymphatic filariasis Hope Group meeting at L’Hopital Ste Croix in Léogâne, Haiti, Antoinette Sainfabe shows how she has modified her shoe to accommodate her severely swollen foot. Despite her troubles, the first thing people notice about Sainfabe is not her big legs, it’s her signature smile, which she generously shares, especially with the Hope Club, part of the Carter Center-supported Hispaniola Initiative, a joint effort by the governments of Haiti and the Dominican Republic to eliminate both LF and malaria on their shared home island. The Hope Club meets regularly at Léogâne’s Hôpital Sainte Croix, the only hospital in Haiti that houses a specialized LF clinic. On the same campus is the office of Dr. Luccene Desir, the Carter Center’s representative in Haiti and the Dominican Republic; his sister Martha Desir, a registered nurse, oversees an affiliated vocational training center for LF patients located one block north. “I love Miss Martha!” Sainfabe exclaimed during a meeting in a sweltering room at the hospital, all the window and doors closed for privacy. The women talked about the importance of gathering to share their experiences, clothes, and children, as well as stigma and charlatans. She said after she started visiting the hospital and receiving proper care, she told the priest he should send LF patients there instead of treating them himself. He ignored her, because he liked getting paid, she laughed. The Hope Club recently qualified for a Task Force for Global Health grant to study how the kind of support the club provides affects patients’ mental wellness and attention to self-care. At the vocational center, LF patients learn marketable skills such as sewing and silk flower arranging. Just as important, many participants form strong personal bonds. 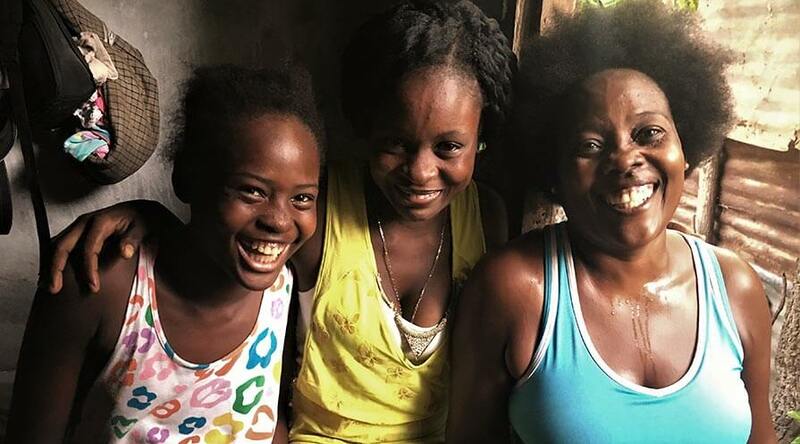 On a steamy summer day in Léogâne, members of the flower-arranging class were grieving the recent death of a classmate and fellow LF sufferer, Yvette Milord, from an unrelated illness. Milord’s classmates created a beautiful blue wreath for the funeral. The funeral procession, led by a traditional brass band, plodded slowly down a dirt road, accumulating hundreds of well-dressed mourners along the way. Several limped on LF-swollen legs behind the hearse, the blue wreath they had made clearly visible atop it among the other flowers. That evening, Sainfabe was back at home with her children and the niece who lives with her. They adore her and accept her, unlike many others who cruelly taunt her because of her swollen legs. “I love my mommy for the way she takes care of me, and she sends me to school,” declared daughter Salma, 11. Sainfabe’s advice to other lymphatic filariasis sufferers is to resist discouragement, avoid isolation, and see beauty in themselves.